After I made the pickled plums to review Tom Kitchin’s recipe book and the plums were devoured, I was left with the most amazing tart juice. I do not like anything to go to waste and so I decided to create a sorbet by adding the juice to some simple syrup. This resulted in the most refreshing pickled plum sorbet and needless to say, it did not last long in the summer. Plums are going to be in season again soon and I have every intention of making both the pickled plums and the sorbet. Just now, I made your tasty sorbet recipe?!!! It is so special too! 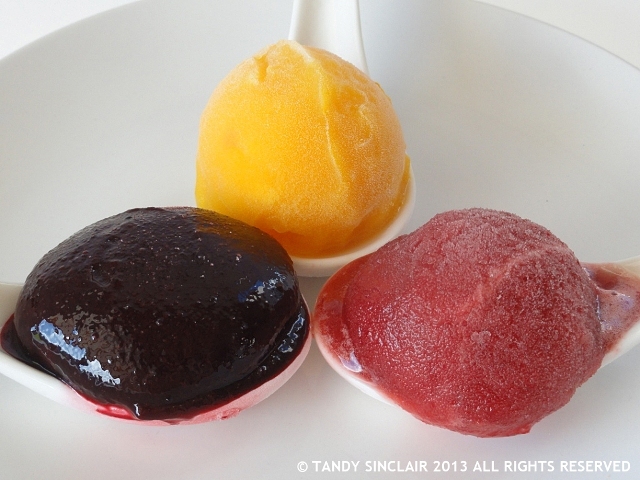 I know it’s winter but I am craving sorbet right now… mmmm! Tandy, how clever of you to convert your leftover juice into such a delicious treat! All three look and sound gorgeous! But I have to say, the idea of the pickled plum sorbet sound especially enticing and distinctive. I’m imagining it, too, as a syrup for roast pork, a side accompaniment to salmon, and any number of other spectacular combinations where plums (particularly amped up in this artful fashion of yours) would be the perfect complement. Fantastic recipe, Tandy! Thank you so much, I think I will have to make another batch to try with some roast pork – great idea! I love how you transformed it into a sorbet! 😀 Waste not at all! I hate waste with a passion! I love desserts like this -simple but packed full of delicious flavour! and so nice for anytime of the day!